Nayeem gets killed in an encounter, few Tollywood celebs get questioned. 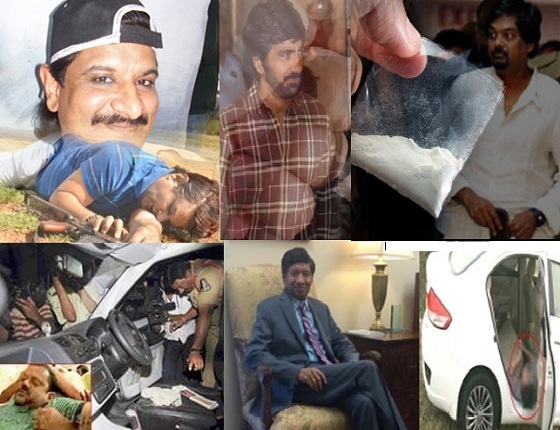 A peddler caught with drugs, Tollywood celebs are called for questioning. Factionist Suri gets murdered, few Telugu producers are questioned by investigation agencies. And now, the investigation around gruesome murder of Express TV MD is also making inroads into Tollywood. As they are digging deep into the profile of one Rakesh Reddy, who is said to be the main suspect in Express TV MD Chigurupati Jayaram’s gruesome murder case. He happens to be a former boyfriend of Chigurupati Jayaram’s niece Shika Chaudhary and is said to be giving warnings to the NRI from a long time. And this Rakesh Reddy is not new to media, as earlier his name popped up when a big heroine was caught in a prostitution racket. Also, he’s said to be involved in the distribution of some high budgeted films along with few front faces who are well known in Tollywood. One wonders why every single case lands up in Tollywood only, but experts feel that cinema and politics are two lucrative areas that could get you high money and higher fame in a short time. But those who try to achieve that in a wrong way will have to count the bars of jail gates in the end. That’s the reality.